It’s been said that two kinds of people live on the Beara Peninsula: those who are born here and those who chose to be here. Either way, everyone knows each other by name and all their sordid history. I’ve already found myself being drawn into that web. It started with my stay in tiny Allhies, and meeting the man named “Mighty” in O’Neill’s Pub. At 57, Mighty, like many here, grew up just down the road. He lives not far from his mother, who was also born on this finger peninsula reaching into the Atlantic. This morning I was in Castletownbere, a village about 20 miles down the road, and while chatting with a man about the ferry to Bere Island, discovered that he lived just around the corner from Mighty. And he had seen me in the pub the night before. No doubt by morning they’ll be exchanging notes on that “red-haired American lady,” as the second gent called me, and her crazy idea to bring tourists to the Beara. Actually all of the local people that I’ve talked to about my tour plans are enthusiastically supportive. They all think the Beara is the best place on earth, and they like that I share their enthusiasm. They all insist there is “loads to do” in whatever area they call home, be it Allihies, Castletownbere, Bere Island or beyond. I’m starting to think my tour isn’t going to be long enough! Maybe I’ll do a Beara, Part One in May and Part Two in the fall! 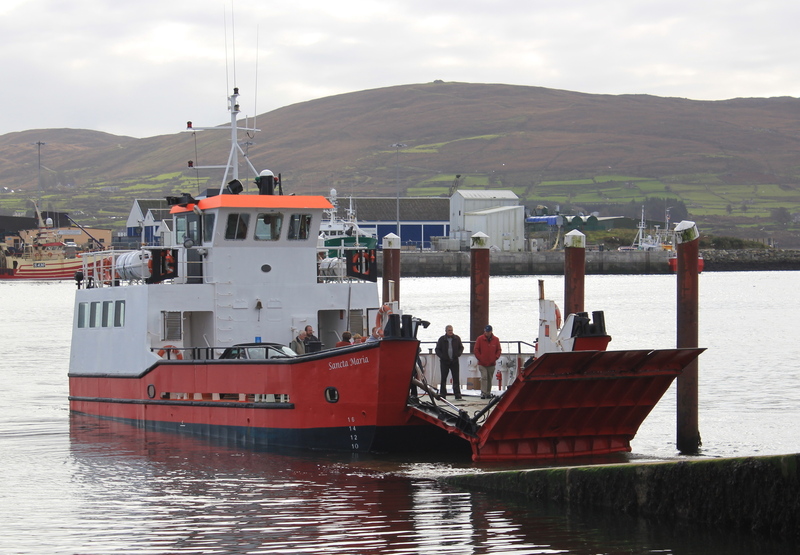 Bere Island ferry pulling into Castletownbere. People walk off, cars back on. The ferry ride was . . . interesting — a boat just big enough to hold four cars, and you had to BACK your car down the boat launch and up the steel loading ramp on the boat! Once the cars were loaded the ramp was pulled up to enclose the bow. The boat trip was expensive, about $35 round trip, and it only ran every two hours. So you can imagine my anguish when my camera battery died just as we docked on the island, and I didn’t have a spare. The ONE day I couldn’t turn around and go back for it! I figured there must be some kind of karma at play, maybe the universe telling me to slow down and just be in the moment, instead of always trying to capture it to enjoy later. So I slowed down, watched the island’s treasures unfold, and took note of some of them. In a small cove: Eleven open-mouthed black lobster pots with blue ropes stacked on the rock wall of the boat launch. Dark blue water, white waves crashing and climbing dark rock cliffs. Thin, black layers of slate upended like stacks of burnt paper washed up against the shore. High on a hill: Steep climb up to round, stone Martello tower reigning over the landscape, narrow spiral staircase winding up to panoramic view. No pirates in sight. Along the way: Abandoned, crumbling stone cottage, one of many, ivy tearing apart what man labored to build. Stone cottage with boarded up windows, one painted with a smiling cat sitting on the sill. Ancient standing stone on a hill marking the center of the island, facing the later Martello tower across the valley. Who’s watching whom? Overheard between two boys: “So he says, how can you be so ugly with only one head?” Now there’s an image to ponder. After I returned to my B&B I replaced the battery and headed back over to Allihies, where I had left my jacket at the last place I stayed. This is what I was greeted with on the main street. I love this place! Note the farmer herding the cows by bicycle. 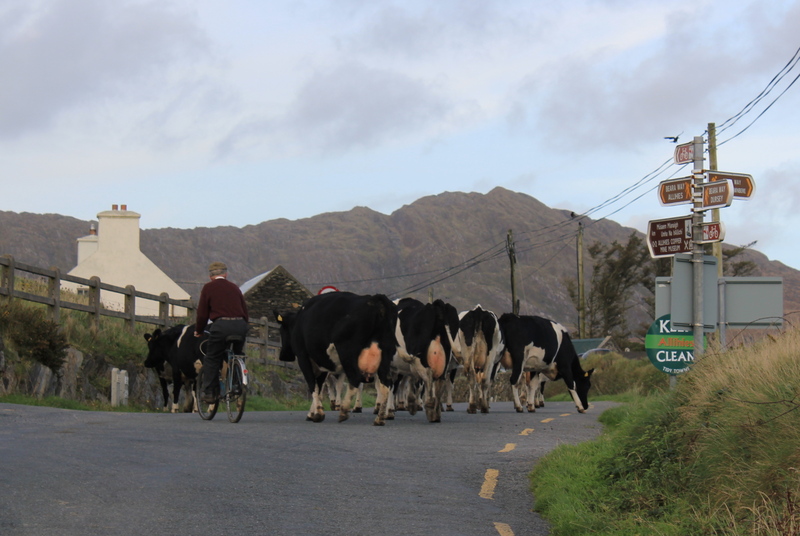 The pace of life is slower on the Beara.